What do you think are the colors in this dress? Do you see white and gold? Or do you see blue and black? The above picture was posted on Tumblr on 26 February 2015; it quickly became an Internet sensation and a source of great consternation, controversy, and distress. 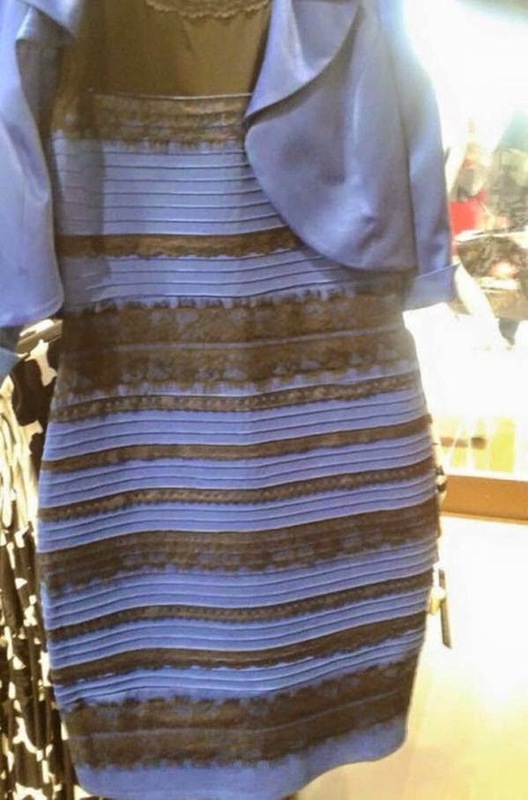 People convinced it is white and gold began arguing with those convinced it is black and blue. The phenomenon has genuinely disturbed many people and their understanding of reality. How can it be that different people can look at the same picture of the same dress and see entirely different colors? For that matter, how can it be that the same person can see different colors of the same dress in the same picture at different times? The dress “really is” black and blue. But how can it be that so many people see the dress as white and gold? Science can provide a few answers. The difference is not in our eyes but in our brains: our brains are used to correcting certain color distortions which take place because of sunlight and other factors based on the environment. The dress is back-lit by the sun in the picture: some people are therefore seeing the dress as white and gold because of the brain attempting to correct for what it believes to be sunlight distortion. Other people, or people looking at the dress at a different time or day or in a different context, see it as blue and black because the brain is not correcting for that perceived distortion. But how can we trust that anything we see is true if we can’t even come to a consensus understanding of what colors are in The Dress? How can we believe anything we see? As many people on the Internet are “seeing,” we cannot entirely trust what our eyes see! What we see is dependent on how our brains interpret the data it receives. Many times the brain does extremely well at interpretation. But not always! As an Internet phenomenon “The Dress” will most likely be short-lived; most people are already tired of it. Yet “The Dress” provides an excellent illustration of an uncomfortable truth: different people can look at the same thing in all good conscience and sincerity and come away with different interpretations. In terms of “The Dress,” some people are over-correcting based on the background; others, or the same people at other times, are not. We see this all the time with other issues. Some people look at America in all good conscience and sincerity and believe the political left has the better answers for the nation’s politics; others see the same America but think the political right has the better answers; still others do not think either the left or the right has the answers. Sports fans all think their team is the best. Furthermore, in the big questions of life, philosophy, and religion–who we are, where we have come from, why we are here, where we are going–people come to a variety of conclusions despite all living in the same world. There is a way which seemeth right unto a man; But the end thereof are the ways of death (Proverbs 14:12) . According to the Scriptures God created this world and its creatures and it was very good (Genesis 1:1-31). When man sinned, however, sin and death entered the world, and corruption and decay along with it (Genesis 3:1-23, Romans 5:12-18, 8:17-25). On account of the fall of man, as Jeremiah the prophet attests, the heart of man has become corrupt (Jeremiah 17:9); the Apostle Paul calls the “old man” of the world “corrupt in sin” (Ephesians 4:22). Therefore, the human mind has been corrupted by sin; our understanding is imperfect and limited, and we are able to think we understand things that we do not understand, know things we do not know, and have confidence in ideas that are actually false. In short, our hearts are easily deceived (Jeremiah 17:9, Ephesians 4:22). In all thy ways acknowledge him / and he will direct thy paths. It will be health to thy navel / and marrow to thy bones (Proverbs 3:5-8) . We must put our trust in God, and make sense of the world through what He has accomplished for us through Christ (Colossians 2:1-10). It may seem strange and crazy, but we do well to remember that the “foolishness” of God is wiser than the wisdom of man (1 Corinthians 1:18-29). So how can it be that so many people look at the Scriptures and the Christian faith and come away with so many different conclusions and interpretations? And he said, “Go, and tell this people, ‘Hear ye indeed, but understand not; and see ye indeed, but perceive not’ (Isaiah 6:9) . Even in Biblical times we read of people who saw the hand of God and yet did not believe. They “saw” but did not “perceive.” They looked at the world in ways which made sense to them and rejected the way God intended for them to see the world. Such happened to the Israelites whom God delivered out of Egypt (cf. 1 Corinthians 10:1-12); so it happened in Isaiah’s day; many who saw Jesus Himself did not believe (John 12:37-41). The problem is not in God, nor the Scriptures, nor in the practice of the Christian faith; the problem, as with “The Dress,” is in interpretation. People often think they see various ideas in Scripture that are not really there, and it is because of what they think is in the background: the religious tradition of which they are a part, their current cultural context, etc. The Scriptures attest to the power of God (Genesis 1:1-2:4); many secularists, on account of the “background” of Darwinism and the Enlightenment, fail to see His power and handiwork (Romans 1:18-20). The Scriptures attest to God’s standards for morality (1 Corinthians 6:9-11, Galatians 5:19-24); many today, on account of the “background” of the sexual revolution, believe those standards to be bigoted and unfair (cf. Romans 1:18-32). The Scriptures attest to God’s truths regarding the plan of salvation, the nature and work of the church, and the means by which Christians can be one in the faith (e.g. John 17:20-23, Acts 2:38, 1 Corinthians 1:10-11, Philippians 2:1-4, Ephesians 4:11-16); many sincere religious people, on account of the “background” of the developments in the “Christian tradition,” fail to recognize the whole truth of God (Psalm 119:160). This is quite daunting! How can we be sure our understanding is accurate and that we see things the way God would have us to see them? We must put our trust in God. We must ask God to give us the wisdom to understand His will according to His purposes (James 1:5-8). We must seek to conform our thoughts, feelings, and behaviors to that of Jesus, and not of the world (Romans 8:28, 12:1-2). Knowledge cannot save; it puffs up (1 Corinthians 8:1). God saves people through faith in the Lord Jesus, those who live according to His love, advancing His purposes (Romans 3:23, 1 Corinthians 13:1-8, Ephesians 2:1-18, 1 John 4:7-21). On our own we may not know much, but we can at least know that we should put our trust in the God who does know. Let us trust in God in Christ and be saved!